Sabatelli family donated $40.00 to Team CCAP April 22, 2019 ... "#RideLikeDave. Thank you, Team 26!" Jen donated $25.00 April 15, 2019 ... "Awesome work Brendan!!" GMa and GPa donated $25.00 April 11, 2019 ... "Have a fun time on your ride." Linda Shoff donated $100.00 April 1, 2019 ... "Way to go Brendan! You are an inspiration! Love mom!" Brian, Linda and Owen Darley donated $100.00 April 1, 2019 ... "We are so proud of you, Brendan. " This will be my second year riding with Team 26, this year we will ride from Newtown, Connecticut to Pittsburgh, Pennsylvania. We are riding with the same message: Peace, Hope, Love. To reduce gun violence, we must all come together as one Nation to stomp out hate. 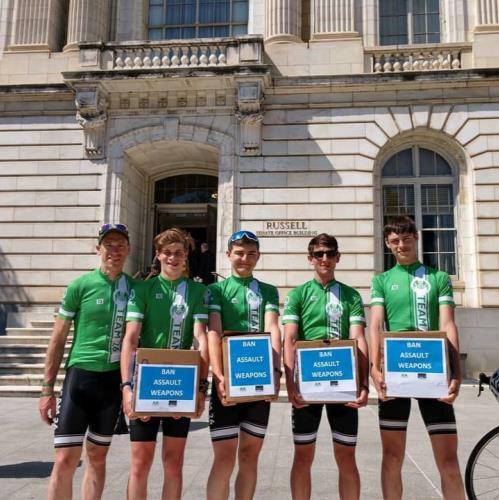 I am riding again for the victims of Sandy Hook, Squirrel Hill, Parkland, Christchurch, Sutherland Springs, and for all victims, families and communities who are affected and torn apart by gun violence each day. Anonymous donated $100.00 April 1, 2019 ... "So glad to support Brendan and this important cause." Robert Schoff donated $100.00 March 31, 2019 ... "Good Luck Brendan.. I know how much this means to you.. "
Liz and Michael donated $50.00 March 28, 2019 ... "Have a great ride! Wonderful cause. " Tom Surwill donated $25.00 March 25, 2019 ... "Proud of you Brendan!" Tyler Comeau donated $10.00 March 26, 2019 ... "Good luck, Brendon! "